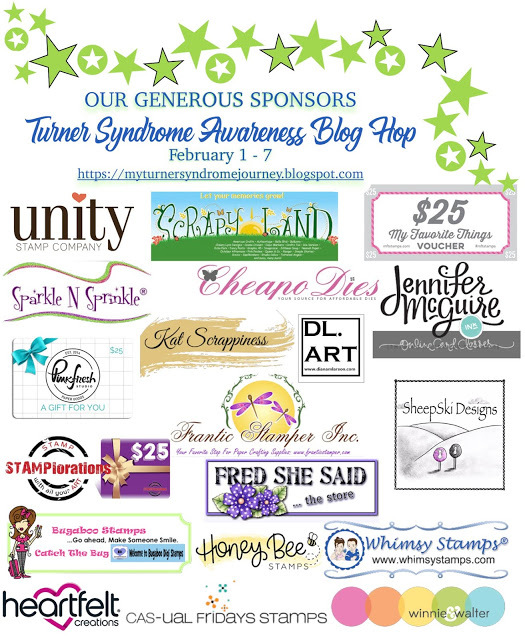 Welcome to the Turner Syndrome Awareness Blog Hop. I was asked to join this wonderful event to help bring awareness to Turner Syndrome. 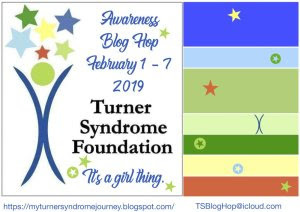 Like me and many others, we really don't know what Turner Syndrome is, it's a genetic disorder where a female is born with only one X chromosome, instead of two, leaving her with life-long medical issues and learning disabilities. For more information on Turner Syndrome, please visit Lori's My Turner Syndrome Journey blog. There are 19 wonderful sponsors that have donated for this wonderful cause. All you have to do is hop along and comment on as many blog posts as you can. 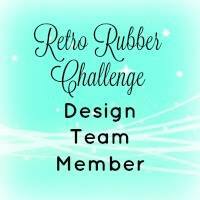 You do not have to comment on each one, but the more you comment the better chances you have at winning a prize. 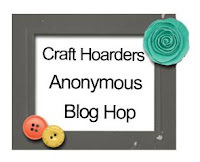 Also, some of the blogs are offering prizes too, so you really should try and comment on each blog. 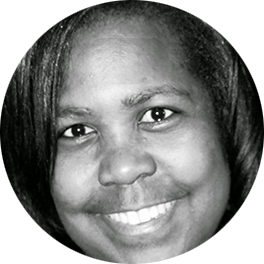 Lastly, after you hop along, you should go back to the Turner Syndrome Foundation blog, and leave a comment about something you learned about Turner Syndrome. These are the colors of the Turner Foundation and my card was inspired by the colors. Here is my card I created for the hop. 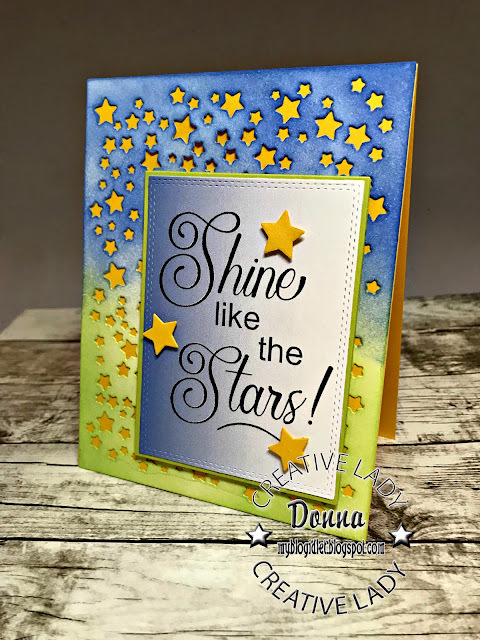 I started with a star background die by Hero Arts, I then used some distress ink to give the background some color. The sentiment was given to us as a gift from Donna Ellis, thank you so much Donna, I loved all the sentiments, it was so hard to figure out which one to use. I die cut the image out with Gina K. Rectangle large single stitched and small double stitched die sets. The I stars are from the large rectangle die set. I hope you have enjoyed my card. Thank you so much for stopping by. I hope you are enjoying the hop. 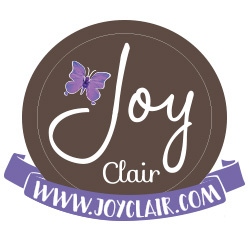 Donna ~ Thank you for being a part of this Blog Hop! I love your starry background paired with that wonderful sentiment! Your card is gorgeous! 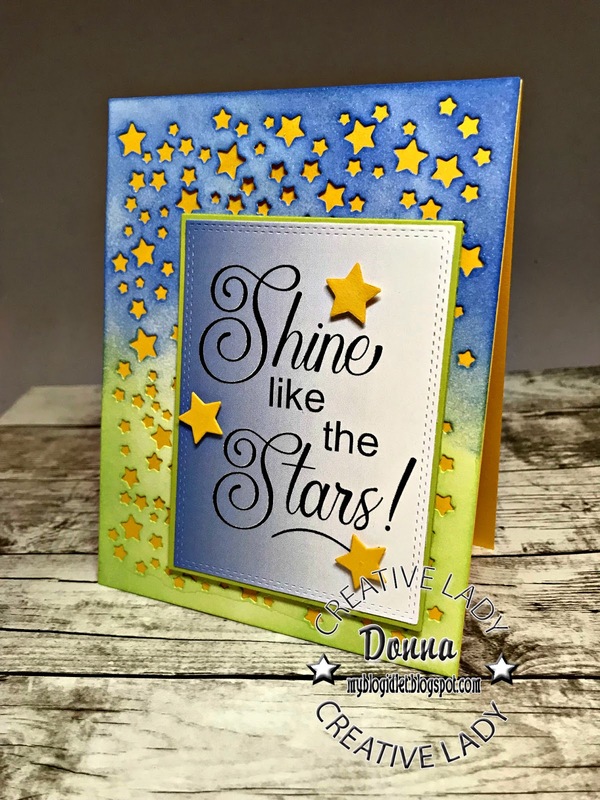 your ink blending is what makes this card Ah-Mazing!!!! I just recently purchased the HA star background die and now I have a bit of inspiration on how best to use it. Thank you!! Love this card Donna, and that you are helping bring awareness to such a worthy cause! Bless you! This is so gorgeous!! The starry background looks amazing!! I love it!! Such a beautiful, thoughtful, colorful card, D! I love the way you have used inking for your colors. It's so full of happiness and hope! Leaving you with wishes for a wonderful day. Oh I love this fun card....that star background is so adorable! Beautiful card Donna, great colors i love the dimension. Thanks for bringing awareness of TS. Beautifully designed card with the awesome sentiment!! This is one of my favorite cards from the hop! Love your colors and your design. This is a fantastic and beautiful card you have made. I love the blending of inks and all the stars. The sentiment is perfect too. Love it! Your card shines! What a COOL CARD! I love the die cut stars! Thank you for bringing awareness to this syndrome and being a part of this hop! Perfect match from your sentiment with the starry background! Nice how you made your lovely card! Amazing card, and love that inked stars background!! Oh how lovely! I love the starry background, and that sentiment is really lovely too! Lovely vibrant colors. Love your star theme. Wonderful creation for the hop. Pretty! I especially like your star theme.... Love that star background die. Thanks for sharing and helping spread the word about Turner Syndrome. OH WOW ... I LOVE your design! How creative and such a happy card! Thanks so much for helping to spread the word about TS! 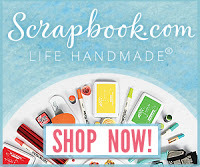 Your card is beautiful and the sentiment is perfect! What a wonderful starry background! Thanks for sharing about TS! Thanks for being part of this TS hop. I have never heard of this syndrome. I love your pretty stary creation! Fantastic card, great images to pair with this sentiment. This hop has been enlightening in information & meeting such a wonderful, caring group of artists. Thank you for being part of it. Wonderful card. That star die cut background is fantastic! The die cut background makes this card POP! Beautiful card! I love the stars and the colors! Awesome sentiment too! Thanks for taking part in the hop to raise awareness of Turner Syndrome! Love the layer and vivid colors. You rock! 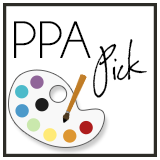 Your card is beautiful and encouraging! Amazing ink blending and that starry background die is so much fun. 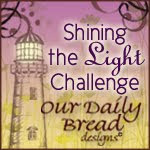 A wonderful sentiment and a wonderful way to finish off this blog hop. Thank you for helping to raise awareness for Turner Syndrome. You ladies are awesome! What a great background for this bright and cheery card! Perfect for this special hop! Oh so pretty! Vibrant, happy and perfectly wonderful card. Love your beautiful starry background. Such a stunning card. I LOVE the millions and zillions of stars!!! Such a pretty card!!! It may have been tough, but you did choose the perfect sentiment to go with all those stars! Your card is absolutely amazing! 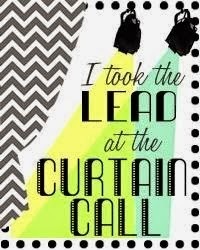 Love it!! I love your card! All those big bright stars can make a person feel like they can accomplish anything! Thanks so much for bing a part of this great hop! wow, amazing design, I love all these stars. Such a pretty card, I really like all the stars that fit the sentiment so well! Dear DonnaYour card is really elegant. Thank you for taking part in the Inaugural Turner Syndrome Awareness Blog Hop to make us aware that such a condition exists among girls. Thank you for encouraging these butterflies to fly. May you be blessed with gd health and happiness always. Hugs and loads of love from Sri Lanka. Outstanding! The pairing of the colors and die cuts and placement of them! A fabulous inspiration card. I like how you did ink blending behind the sentiment. 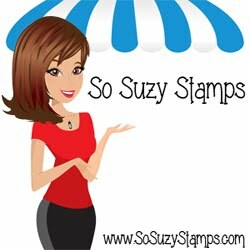 Love your card! 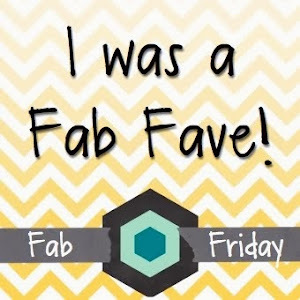 Thank you for being part of this blog hop!